Muscle cramps are when a muscle gets tight (contracts) without you trying to tighten it, and it does not relax. Cramps may involve all or part of one or more muscles. Muscle cramps are different than muscle twitches, which are covered in a separate article. Muscle cramps are common and often occur when a muscle is overused or injured. Working out when you have not had enough fluids (dehydration) or when you have low levels of minerals such as potassium or calcium can also make you more likely to have a muscle spasm. If the muscle is still sore, nonsteroidal anti-inflammatory medicines can help with pain. If the muscle cramps are severe, your health care provider can prescribe other medicines. The most common cause of muscle cramps during sports activity is not getting enough fluids. Often, drinking water will ease the cramping. However, water alone does not always help. Salt tablets or sports drinks, which also replenish lost minerals, can be helpful. Is the cramp always in the same location? Have you been vomiting, had diarrhea, excessive sweating, excessive urine volume, or any other possible cause of dehydration? Clasp your hands behind your back with your palms facing up. Pull your hands down and press your shoulder blades together. Your chest should stick out. Hold for 10-20 seconds. You should feel the stretch in your upper arms and chest. Stand with your legs wide apart. Shift your weight to one side, bending your knee somewhat. Do not let your knee bend beyond your ankle; in other words, you should be able to look down and still see your toes. 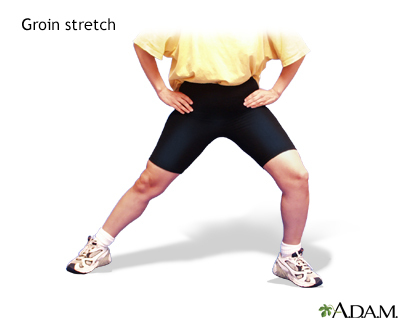 You should feel the stretch in your opposite leg, which remains extended. Both of your feet stay flat on the ground facing forward. Hold for 10-20 seconds, then lean to the other side. Extend one leg in front of you with the foot flexed. Bend your other knee and lean back slightly. Your pelvis should be tilted forward. 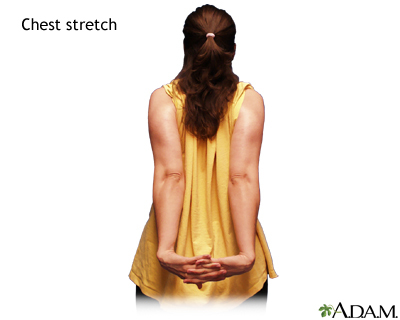 Keep your upper body upright as you hold the stretch for 10-20 seconds, then switch sides. 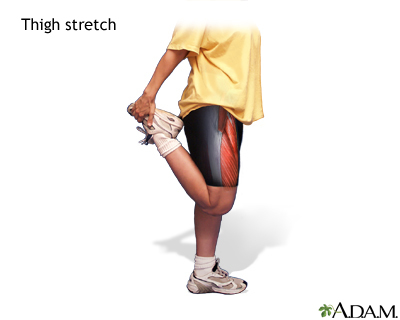 You should feel the stretch up the back of your extended leg (all the way up your calf and thigh). NOTE: Your supporting leg may get tired, as you have to balance your weight on it. Stand with one foot in front of you and your weight equally distributed between them. Bend both knees and lift your back heel off the ground. Bring your pelvis forward so your back is flat. (You can lean against a wall or column for balance.) Hold for 10-20 seconds, then repeat on other side. You should feel the stretch in the front of the hip and into your abdomen. Hold on to something for balance. Standing on one leg, grasp the foot of the other leg. Keep your knee pointing down. Pull up with light pressure. You do NOT need to pull up all the way to your buttocks. If it feels uncomfortable or painful, you are putting too much strain on the knee joint. Hold your foot behind you for 10-20 seconds, then switch sides. You should feel the stretch in the front of the thigh. Bring one of your elbows across your body, towards the opposite shoulder. Use your other hand to bring your elbow closer to your shoulder. Hold for 10 to 20 seconds, then switch sides. Alternate method: raise your arm over your head and bend your elbow all the way so your hand is behind your neck. Use your other arm to stabilize your elbow. Hold for 10 to 20 seconds, then switch sides. 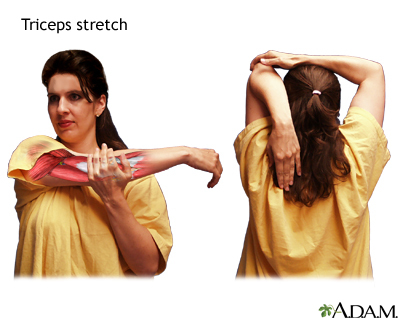 You should feel either of these stretches in the back of your arm.